In the aftermath of a natural disaster, heroes prevail. From paramedics to relief workers, the saviors are obvious. There are, however, unsung heroes. On September 9th, 2017, category five Hurricane Irma made landfall in Florida. As millions of Florida residents and tourists fled the state in search of high land and dry ground, a convoy of these unsung heroes charged south. The fleet left Plymouth, Indiana, on Saturday morning as Irma descended upon Florida. The destination: Tampa, Florida, where the eye of the hurricane passed over the city. The caravan of construction vehicles bore the blue-and-white logo of the Northern Indiana Public Service Company, NIPSCO to most. Between the 30-some diggers, bucket trucks, backhoes, and pickups, there were 33 linemen, four supervisors, an engineer, and a safety coordinator. These unsung heroes- linemen- are responsible for power restoration every day. They fix broken poles, repair damaged wires, and bring light back to dark places, sending electricity down the line to homes, hospitals, and shelters below. The NIPSCO linemen’s work is typically done locally, as far east as Angola and as far west as Gary. When the weather is bad enough, usually following a severe thunderstorm with gusty winds or a blizzard with significant ice, the NIPSCO linemen offer their help to neighboring states. This time, the linemen are offering their efforts seven states away. “For circumstances like this and other major storms, an association of all utilities organizes a ‘mutual aid’ series of conference calls where utilities with major outages request help detailing the specific needs, number of lineman, types of needed equipment, assessors, etc. We are currently committed to helping Tampa Electric Company,” Justin Van Ouse, construction line supervisor, said. Hurricane Irma caused an estimated 16 million power outages. 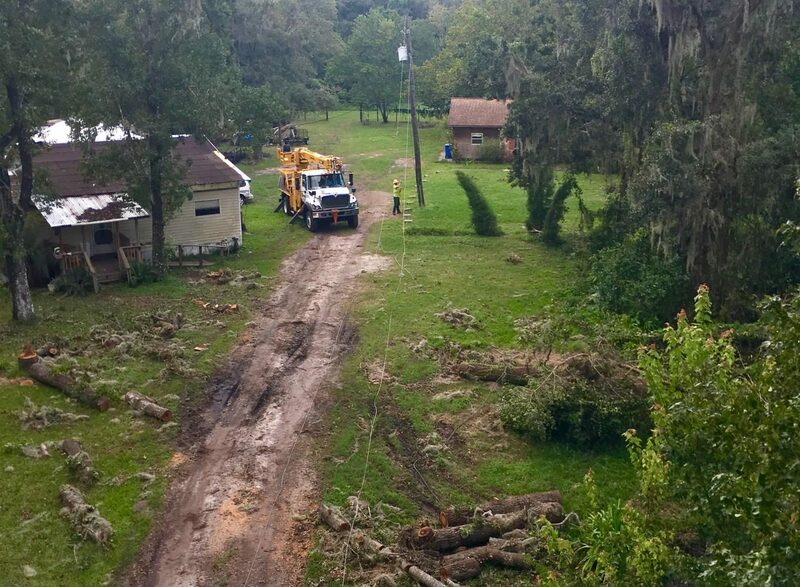 With outages of such magnitude, crews from all across the country, from all different electric utility companies, are assisting the Florida utility groups. NIPSCO is one group of many assisting the state, and their stay has no timeframe. “It is unknown how long we will remain in Florida. It is dependent on the amount of damage compared to the amount of crews on site. Once our host utility releases us, there is an additional chance that another utility will request our assistance,” Van Ouse said. While some of the linemen have worked hurricanes before, others have only worked local outages following thunderstorms and snowstorms. The hurricane work is an entirely different beast. “Hurricane work differs in the magnitude of damage. It’s more that just the power being out; large parts of the towns you’re in can be destroyed. It can be difficult to find fuel, food, water and lodging,” Wally Schult, 10 year linemen for NIPSCO, said. No customer likes to be without power, and that displeasure toward the situation is sometimes transferred from the issue to the men fixing it. Currently, most Florida residents are thankful for the linemen’s efforts, but the linemen are aware that this might change as time progresses. “So far the people have been very kind, but as things drag out, I’m sure patience will wear thin,” Ken Hargis, senior journeyman lineman, said. Linemen are accustomed to being ridiculed by customers, however. They persevere in the face of adversity, even when that adversity is an irate customer who yells and swears. “I’ve had people angry that we would cut their power when the weather head was broken off the house, but cutting the power- that’s for their safety,” Jason Higley, journeymen lineman, said. When the hurricane left 16 million people without power, it also destroyed much of the infrastructure and lodging in the state. For the linemen, this means uncertainty in housing and accessibility to what needs restored. “You never really know what you’re getting into until you’re in it. We’re expecting that we may need to sleep in the trucks or a tent city. It’s going to be 16 hour workdays, hot and muggy, and who knows if we’ll have access to showers,” Schult said. With this hurricane work comes another fear for the linemen that is unique to Florida alone. “I hate snakes, and Florida is full of them,” Hargis said. More than just operating under an unknown timeframe, having a lack of accommodations, and struggling through grueling workdays, the men face the difficulty of leaving family behind. “I have to give a lot of credit to my wife at home with our three kids. My son is five and is special needs; he has cerebral palsy among other issues. He’s a handful to take care of by himself but we also have a two year old daughter and a one month old daughter. So my wife is definitely busy with me being gone,” Schult said. Those who did not leave behind children still left behind something, be it the comfort of home or the companionship that exists there. “I left my wife and two adorable puppies at home and am already missing them and my own bed,” Hargis said. Though leaving family and familiarity behind is daunting to the linemen, the prospect of leaving millions in the dark encourages them to work through the 16 hour days. “I like helping people when I can with the skills I have acquired working with my brothers. I’m excited to get to work, to help people get back to normal,” Higley said. The feeling is unanimous across the company. The empathy of the men working to restore the sunshine state motivates them. “You really feel for the people that are trying to cope and rebuild their lives,” Schult said. In spite of the uncertainty regarding this NIPSCO excursion, from the time frame to the severity of damage and lack of housing, there is one certainty that remains: Linemen, the unsung heroes in the aftermath of Irma, will work through the storm.